UX/Product Designer in the Bay Area. This was a team concept project for Etsy. Etsy is an online global marketplace that specializes in handmade items. Etsy provides a place for makers to sell their goods and reach a large audience. There are many talented individuals who are specially skilled in certain areas. Customers can search for the items they’re looking for, but sometimes they have a product on their mind that they’d like created for them. We were tasked with creating a feature that allows customers to post a product request and receive quotes from artisans. 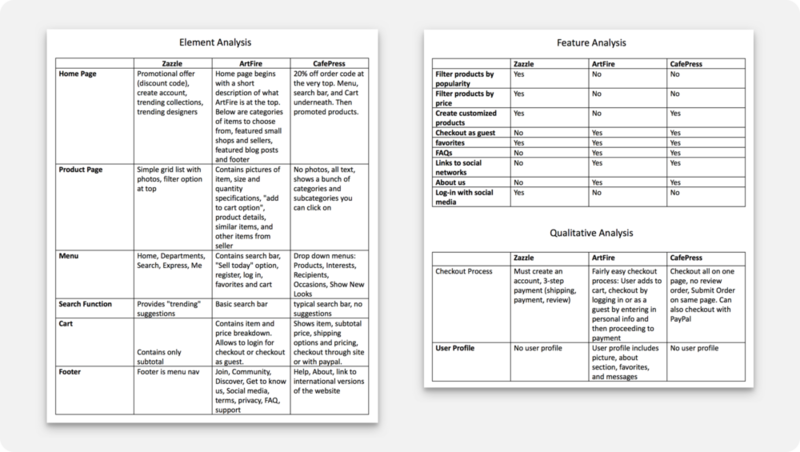 If you'd like to skip the research, you can jump to the Wireframes. Feature that allows buyers to enter and post custom orders for seller bids. Feature that allows sellers to make bids on customs orders. Once all the research was done, we created sketches based on our User Research. We had to familiarize ourselves with the Etsy and Sell on Etsy apps to create these sketches. We didn't want to redesign the whole app, we just wanted to add our feature on to it. These are a few of the many sketches that were created. 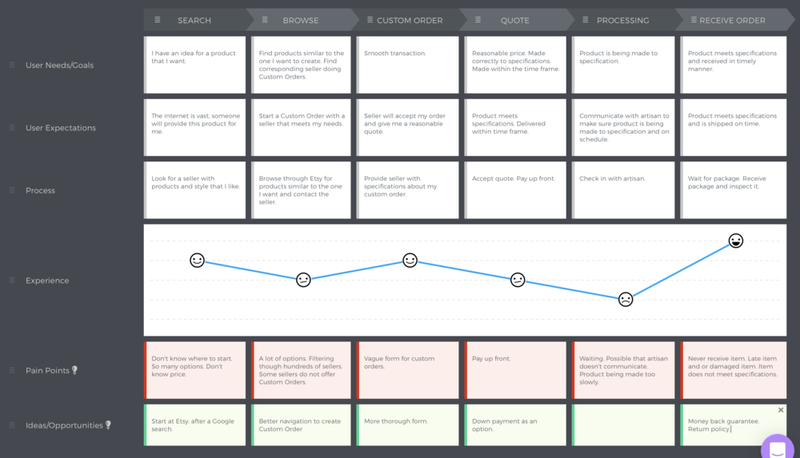 This is a lo-fi prototype for our buyer flow simulating our feature on the Etsy app. We were able to load these on to our phones and do user-testing with them to get more accurate results. The trends we noticed were that users were confused by the "Name Your Item" part of the custom design order form, they would just read "Name" and then input their own name instead of a name for the item they're ordering. Users were also confused by the lack of uniformity between terminology like "Bids" vs "Orders" and "Requests" vs "Designs." Users also suggested having two input boxes for "Price Range" instead of just one. 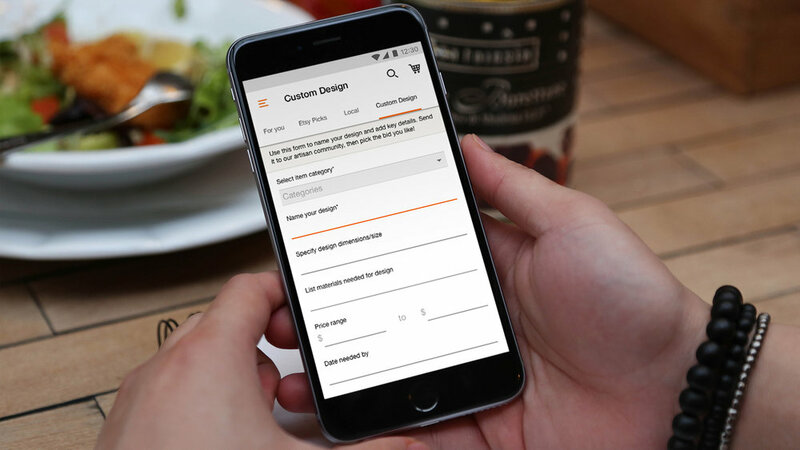 In general, all of the wording on the custom order form page could be better, we discussed using a conversational questioning method. This is the lo-fi prototype simulating the feature on the Sell on Etsy app. User testing showed that the boxes for Orders on the "Design Requests" page could be smaller so that there would be less scrolling to see all the information. User research showed that it would be useful for sellers to leave a message for the buyer when submitting a bid for their design in case the design instructions were a little too vague and the seller had to convey some conditional terms to their bid price. These two pages have been annotated, the rest of the pages were annotated as well and can be viewed here. User Testing showed there was too much text at the top of the form page. Four lines of text was condensed to two lines. Users did not like the limited character count for the fillable areas of the form, it has been removed. Seller research showed that sellers would prefer to have more details about an order so we created a form that included more specific information. User testing showed that some of the wording used on older iterations was confusing so we changed it to be more understandable. The edit buttons used to be darker on the previous iteration of the confirmation page and users found it distracting so we faded them. We also made sure everything was left aligned as that was a user complaint in the last iteration. User testing showed that users wanted an option to delete added photos on the confirmation page so Xs were added. Users liked having the little number notification indicator on the side menu for "Design Notifications." Previous iterations of these pages still had the “Etsy” logo at the top to go home and the titles for the pages were too small and easily ignored. Users became confused as to what page they were on. We replaced the Etsy logo with the title of the pages. Users wanted a way to communicate with artisans before accepting a bid so we implemented a chat icon to initiate a conversation with the seller. User research showed that users wanted to know more about the artisan before accepting their bid so we created a button on the bids page to allow them to visit artisan stores and look at their other work. User testing showed that the old iteration had too much information in these boxes so we hid some of the information. It can be accessed by pushing “See additional info>” User testing showed that artisans still wanted to see order details on this page so we included it. For this team project I felt like my visual design was good enough and I wanted to focus on the research aspects of the project. We all participated in developing the Competitive Analysis and Empathy Maps. We went through a few iterations of user flows and I put them together in Gliffy. 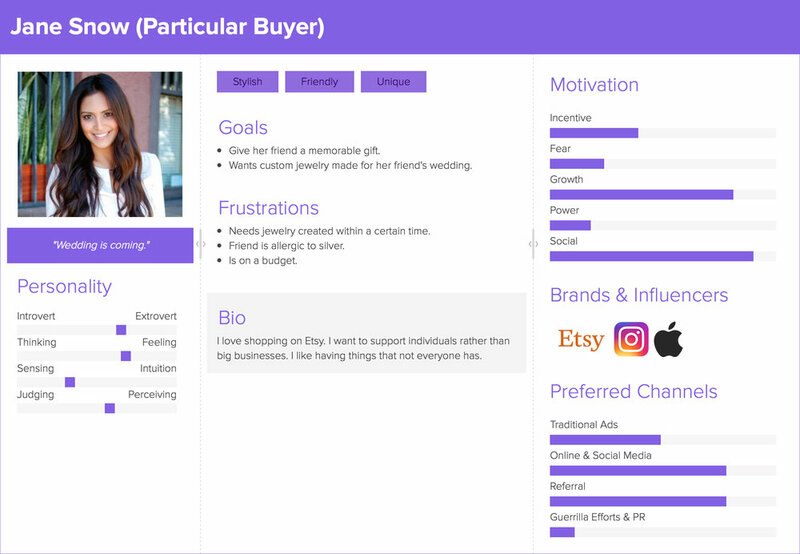 I made the Buyer Journey Map and Buyer Persona with input from Dylan. I conducted user interviews with buyers and sellers. I put together the infographic for User Research Findings. I also did user testing along with my teammates. I was also put in charge of putting together our final case study that you can view here. As a team we worked really well together. Our strengths and weaknesses synergized well. We came to a consensus on practically all of our decisions. We also made a plan on day 1 and stuck with it throughout our two week sprint. Some of the challenges we faced were that none of us were Etsy users. We had to acquaint ourselves with the app and we also found out there was a separate "Sell on Etsy" app that we had to accommodate for for the Seller Flow. Luckily, my sister is a seller on Etsy, so I borrowed her credentials to log into the Sell on Etsy app and become familiar with it. We didn't want to redesign any of the apps because that was not the point, we only had to add a new feature, so we made sure to become familiar with Etsy and try to use their design language without any Style Guides.